I'm doing something I haven't done in ages! Participating in a blog tour. I just couldn't pass up the sound of this book! Morgana does not speak and she is about to be married to a man who has agreed to be respectful and kind, but offers no love. Her own mother is dying and this is the only real option she has. Her soon to be husband, Cai, must marry her in order to keep his position in the community as the drover...having a wife ensures he'll return home. As is to be expected in stories like this, it doesn't take too long for these two to become more interested in each other than they initially thought they'd be. But this book is more than just a conventional romance because Morgana is a witch! And as she settles into her new home, we learn about her history of magic and a threat rises up against her. These provide the necessary roadblocks to allowing the couple to be truly happy. And like any romance, these felt frustrating at times! In many ways this felt like a traditional romance despite the magic--the story is told in alternating points of view--Morgana's first person point of view, and Cai's third person. This can feel a bit distracting, but is not unusual for romance since both hero and heroine need their space to tell the story. The descriptions and prose are all fine, I found the book fairly easy to read, though I did find myself skimming a bit through some parts. A nice quick read for a long winter's day! (tw: sexual assualt) Check out the gorgeous cover! 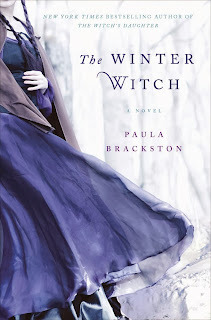 You can visit Paula Brackston on Facebook, and her website. You can read an excerpt of The Winter Witch, watch the trailer, and check out the polyvore board inspired by the book!